Seductive and gripping life of the jazz-influenced band vocalist-recording-star-cafÇ singer-composer-actress--and a necessary corrective to Miss Lee's rather strange, mannikin-like appearance on recent TV outings. The first quality that grips about Lee's autobiography is that she clearly wrote it herself--aside from some "interviews" she quotes--and that her voice and delivery come through nicely, thank you. This is the only-in-America or in fairy stories hard-luck tale that awards the slavery girl her Prince Charming, big, big success, money, glamour, and great homes, and yet keeps her battered with blows that would fell a less gritty lady. Her life has been accompanied by some of the world's most famous people sitting at table at her performances or chatting her up when illness strikes or when visiting her home; these include Cary Grant (who always left her speechless and shy no matter the depth of their 27-year friendship), early helpmate and Hollywood neighbor Frank Sinatra, and other towering world celebs. A Swedish-American, beginning life as Norma Deloris Egstrom in Jamestown, North Dakota, in 1922, she was raised on a farm worked hard from earliest childhood, was beaten constantly by a vile stepmother. Later, life itself gave the beatings, but by then Norma had become Benny Goodman's singer Peggy Lee; found Ernest Holmes' Science of Mind, and soon made a lifelong friend of Holmes himself. Her successes include many megahit records, an Oscar nomination for her role in Pete Kelly's Blues, composing songs and dubbing voices for Disney's animated feature The Lady and the Tramp, and her recovery from a staggering series of illnesses. Meanwhile, she loved all her husbands, but their alcoholism or jealousy of her success always doomed the marriage. 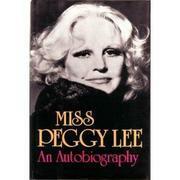 A terrific read that leaves one wishing Miss Peggy Lee the best.